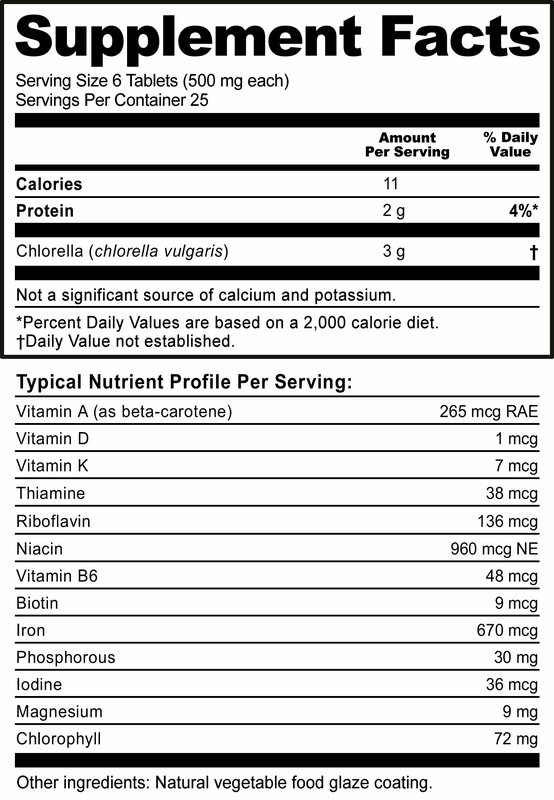 NutriBiotic Chlorella 500 mg, 150 tabs. Chlorella's tough protective cell wall is broken by special low temperature processing, making over 90% of the vital nutrients easily digestible and bioavailable. Chlorella is one of nature's best food sources for chlorophyll. This microalgae also provides a wide range of vitamins, minerals, and trace elements. Chlorella and natural vegetable food glaze coating. Made without milk, soy, egg, yeast, corn, wheat, fillers, sweeteners, colorings, flavorings, binders, and preservatives. 6 tablets daily, with or without meals as a concentrated dietary supplement. WARNING: KEEP OUT OF REACH OF CHILDREN. Accidental overdose of iron-containing products is a leading cause of fatal poisoning in children under six. In case of accidental overdose, call a doctor or poison control center immediately. As with any supplement, you should consult your physician before using this product. If you are nursing, pregnant, or considering pregnancy, you should consult your healthcare practitioner prior to using this product.